Thor, Germanic thunder god. The hammer is associated with the thunderbolt. Painting by Mårten Eskil Winge, ca. 1872. The Germanic peoples are a linguistic and ethnic branch of Indo-European peoples. They came from Northern Europe and are identified by their use of the Germanic languages. Migrating Germanic peoples spread throughout Europe, mixing with existing local populations (such as Celts, but also Slavs/Vends and Romans), forming the future basis of many nations, that are connected by similar languages and common history, and culture. Latin Germani is first used by Julius Caesar. But the Germanic tribes did not have a self name that included all Germanic-speaking people. In English, German is first attested in 1520, replacing earlier use of Almain or Dutch. Dutch is now used in the English language to refer to the language and the inhabitants of the Netherlands. 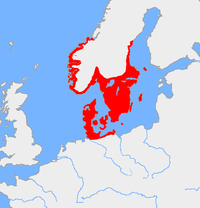 Jutland and the Danish islands (Ingvaeones). The Sons of Mannus Istvaeones, Irminones, and Ingvaeones are collectively called West Germanic tribes. In addition, those Germanic people who remained in Scandinavia are referred to as North Germanic. These groups all developed separate dialects, the basis for the differences among Germanic languages down to the present day. The division of peoples into West Germanic, East Germanic, and North Germanic is a modern linguistic classification. 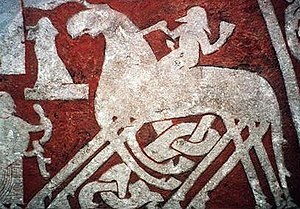 Odin riding on Sleipnir (Ardre image stone, 8th century). The early Germanic tribes spoke mutually intelligible dialects, and shared a common culture and mythology (see Germanic mythology), as is indicated by Beowulf and the Volsunga saga. In the absence of large-scale political unification, such as that imposed forcibly by the Romans upon the peoples of Italy, the various tribes remained free, led by their own hereditary or chosen leaders. This page was last changed on 11 December 2014, at 04:57.